There are always certain risks when you travel without a firm plan, and we’re well aware of them. Spontaneity is fun, except when Plan A, B, and C all fall through and you find yourself having to improvise to find a place to park overnight. Then it becomes a challenge. We left Winslow AZ yesterday around noon, after taking some time to explore the ruins at Homolovi Ruins State Park. 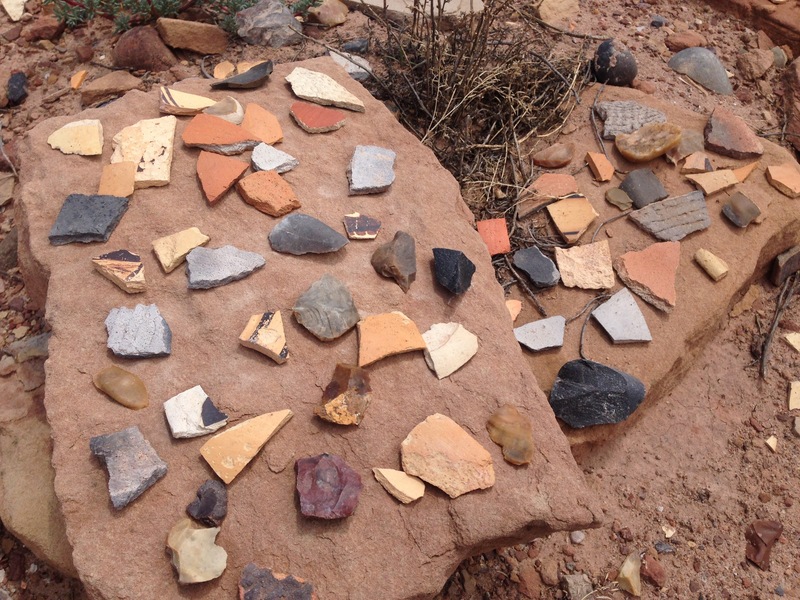 (It’s an interesting site, without much interpretation but literally piles of colorful potsherds and bits of half-buried pueblo walls to inspire the imagination.) Thunderstorms were building all around, which lent a certain drama to the vast open skies of this part of Arizona, but also reminded me that we didn’t know exactly what we were driving into. Our route north took us through the Navajo Nation, which is huge and mostly open, up through the towns of Chinle and Many Farms, and then up Rt 191 into Utah. This is a fabulously scenic drive, and Eleanor kept saying that more people should have the opportunity to see this gorgeous part of the country. Photos can’t capture fully the panorama that keeps emerging around each turn. You need to get on your motorcycle or in your car and drive it yourself. Our plan was to drive for six to seven hours. There is little cell service in this area, so on-the-road planning with the iPad wasn’t practical. I resorted to the way we did it in our first days of full-timing, consulting a dog-eared Road Atlas and guessing where we might feel like stopping for the night. 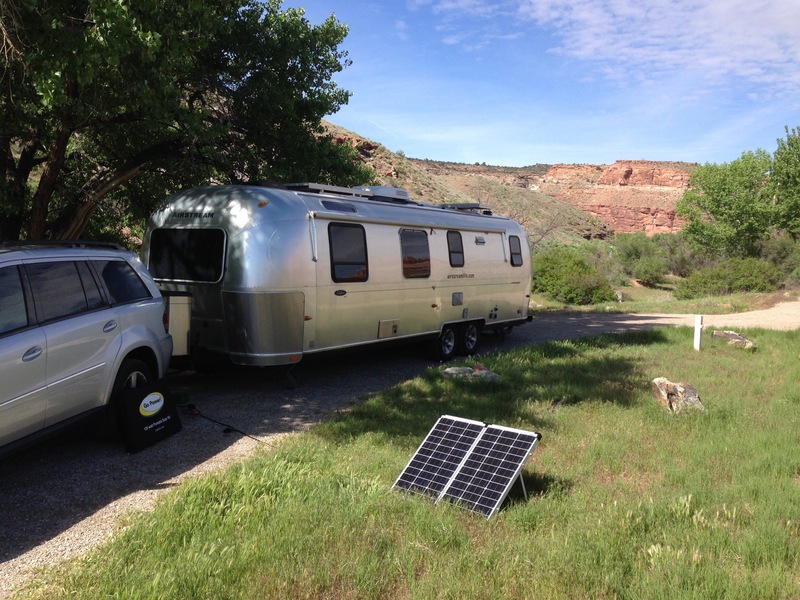 We were working against a few factors: No cell service, widely spread out camping options, a popular time of year in the Four Corners, the threat of severe weather, and a late start. We passed a delightful looking spot along a river near Bluff UT only because there are no cell service and I thought I might need to do some work in the evening. That turned out to be a mistake, because the place we eventually ended up also had no service. By dinner time we had roamed up through Moab (which is getting a bit touristy in the center), turned right onto Rt 128, and began hunting for a spot amongst the tall red rock sandstone canyons that wind along the Colorado river for about 25 miles. From a prior trip we knew there is a string of small no-hookup National Recreation Area campgrounds here, and we figured that being a Tuesday it would be no problem to find a spot we could tuck into for a night. Alas, not so. We checked out ten different campgrounds, each filled with tents and kayakers. Most of the sites were sized only for tents, so even if they had been empty we couldn’t have stayed. The sun got low and we started thinking about our options, which weren’t good: turn back to Moab (now nearly 30 miles of twisting road behind us) or proceed to Fuita CO (at least an hour away). And it was now 8:00 pm with official sunset descending at 8:26. This is when your resolve to fly without a plan gets tested. This is when people get grumpy. Fortunately we’ve been in this situation many times and know better than to panic or start the “I told you so” sort of discussion. It’s important to remember that nothing really bad is going to happen. The worst case is that you have to drive further than planned and compromise your campsite ideals for a night, staying somewhere that you might not have chosen but which is still suitable and safe. We got lucky. The very last campground along Rt 128 is Dewey Bridge, a tiny 7-site spot with (like all the others along this route) no amenities. We snagged the last available space, just ten minutes before official sunset (and long after shadows in the deep canyons had covered us). $15 per night for nothing but a spot by the river, but we were glad to get it. 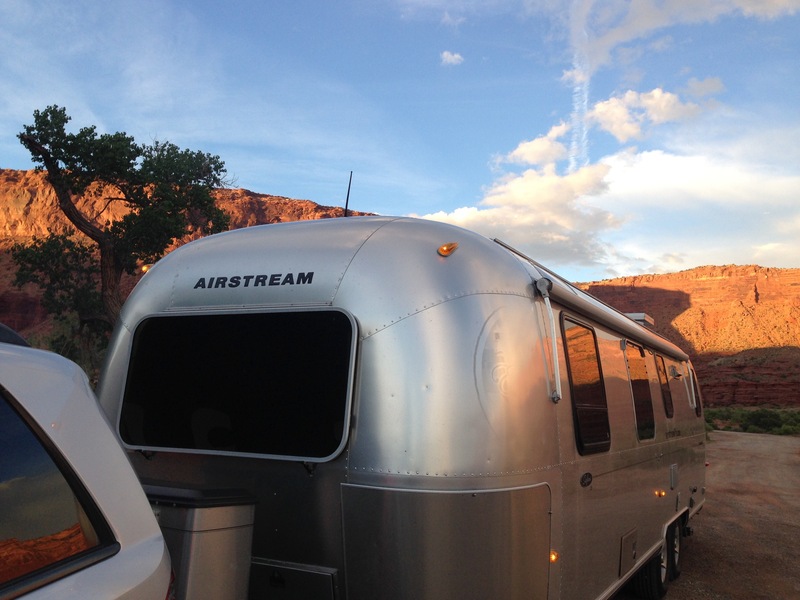 I feel almost embarrassed to relate this tale of sheer luck to you, since by all rights we should have been forced to our penance somewhere along I-70 in Colorado instead of landing a bucolic site in a canyon along a scenic river. It might have been a more cautionary tale in that case. But it’s the same point either way: “spontaneous” can be good or bad.